Another one for you car lovers! 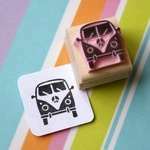 In addition to my vehicle range comes this rubber stamp inspired by the classic British Mini. This stamp is packed full of recognisable detail and a lot of fun! The stamped image measure approx. 2.3cm x 2 cm (or 7/8” x 3/4”).